A leaked presentation has exposed Microsoft's tentative plans for its retail stores —and the high degree to which they'll imitate Apple stores, down to their layouts and even the presence of a dedicated "Guru Bar" for help. 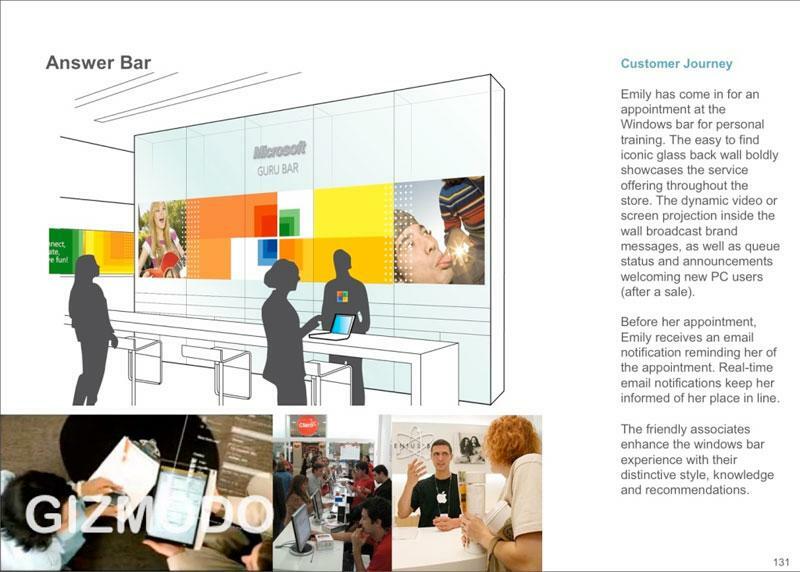 A leaked proposal for Microsoft from design consulting firm Lippicott immediately provides hints of an Apple connection with a bright, open layout where the center and edges of the store are dominated by computers showing the "seamless" link between Windows PCs and peripherals. Themed areas would push specific products, such as home theater PCs, netbooks or Windows Mobile and Zune devices. On closer inspection, though, the influence becomes at times extremely close. The reference store seen by Gizmodo would have a Guru Bar —in some slides labeled as an Answer Bar or Windows Bar —that would directly copy the Genius Bars at Apple stores and let customers make appointments either for help or just to ask questions. The number of products would be kept to a minimum to avoid the confusion present in stores where most Windows PCs are sold today. Microsoft's outlets would even revive the theater component that Apple has mostly tossed aside: an "event space" at the back of the store would provide a dedicated screen and seating for training sessions or social events. Lippicott isn't shy about where it takes its cue and shows the positive experiences it sees in other major, if not always successful, retail brands. Apple is held as the best example for its branding, simple layouts, and enthusiastic staff, but others aren't quite treated so kindly. Sony stores are criticized for "uninformed" staff and poor layouts, while AT&T and Nike are also docked for certain weaknesses. Customers could even set aside parts of the store for paid private events, such as custom group training or, oddly enough, birthday parties. 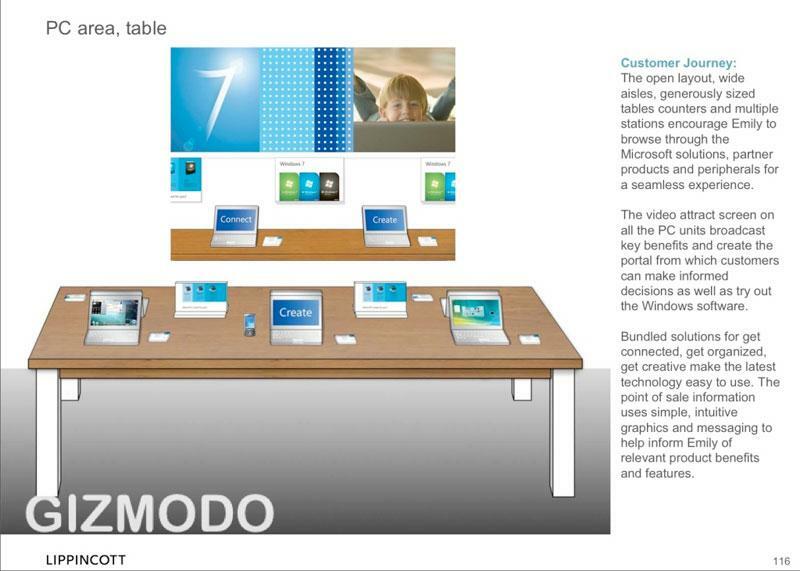 The standard PC tables at the proposed Microsoft store design. | Image credits: Gizmodo. A Guru Bar at the tentative Microsoft store. | Image credits: Gizmodo. Lippicott's positive view of how the Apple store concept could benefit Microsoft. | Image credits: Gizmodo. Where Microsoft would differentiate itself is in the technology behind the shopping experience. Instead of static graphics, a giant store-length display would advertise new products and change with the season or with major launches. Not surprisingly, multi-touch Surface tables would be omnipresent to give shoppers demos of certain experiences, and customers could order computers online or even print custom notebook decals at the store. As the extensive document isn't necessarily representative of Microsoft's final action plan, it's undetermined just how much of this experience would actually reach the finished stores when they open in the fall. The slides indicate that the store arrangement may be intended for flagship stores and, by extension, could be scaled back for smaller locations. However, they do corroborate previous reports that the stores will be showcases for Microsoft's ideal vision of computing rather than a store meant to move as much product as possible. Company executives have previously sworn that the stores wouldn't echo Apple "in the long term" and that the future shops would serve as incubators for ideas other retailers could use to improve their own stores. 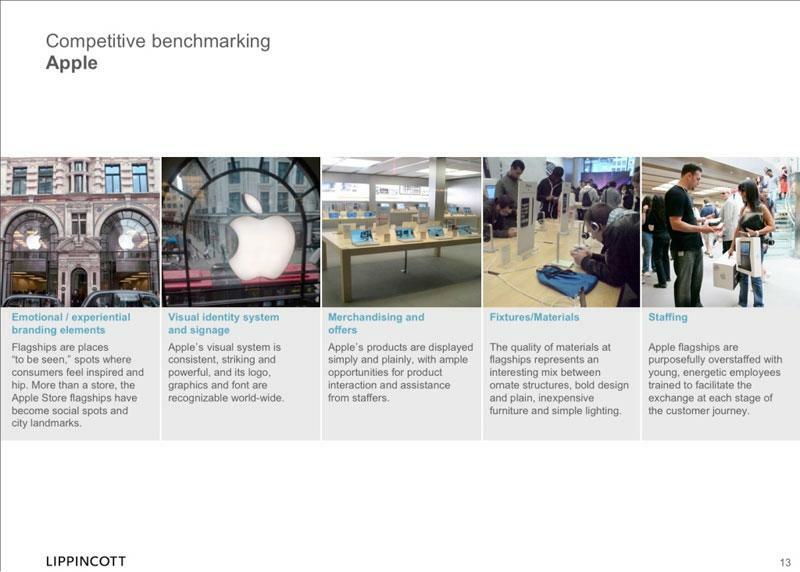 All the same, the new presentation shows that, at least in the short term, visitors to Apple's shops will find more than a few similarities in what Microsoft plans to offer.